Website Design by Sulogy Softech Pvt. Ltd.
We are a one stop shop for all your Recharge needs. Under one roof you get all the services, Rechargeguru.net is counted among the reputed names in the industry engaged in providing all kinds of Mobile Recharge and Digital payment solutions. Online recharge, top up, your Indian Mobile & DTH TV. Easy Recharge for following companies are available. : Airtel Mobile GSM, Vodafone Mobile GSM, Idea Mobile, MTNL (Trump) Delhi & Mumbai, BSNL GSM (All India), Tatadocomo, Reliance Jio 4G Mobile & Jio Wifi, Jio DTH &. 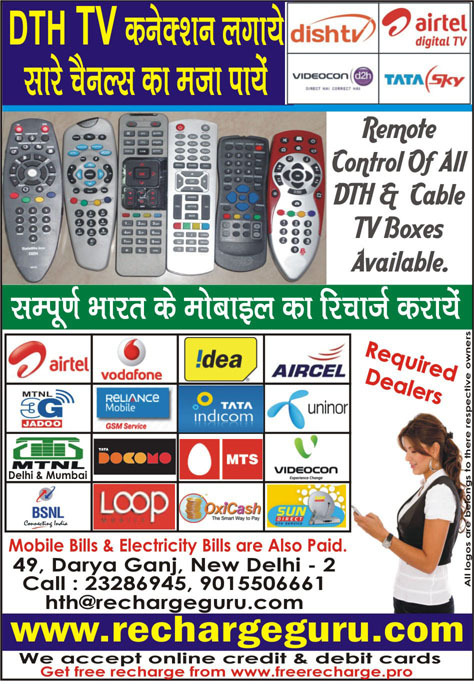 Tatasky, Dish Tv, Suntv, Airtel DTH, Videocon d2h & Reliance Bigtv recharges. We are also providing digital payment services Aeps, mPos, Pancard, Irctc Login, Train Ticket, Travel Services and Holiday packages. One good news, our website has got the maximum telecoms recharge system. Our website is alone and unique providing all recharges of all telecoms of INDIA. ANNOUNCEMENT:- Rechargeguru is providing high flexible margins for recharge and bill payment to all retailers and distributors.